Morocco, a country located in North Africa bordered by Algeria, Western Sahara, North Atlantic Ocean, and the Mediterranean Sea has a total land area of 274,460 square miles and a population of around 33 Million. The varied topography of Morocco – mountains, desert, coastal plains etc., makes it very bio-diverse. Its economy is considered liberal and the government is aggressively privatizing the public sectors. The major contributors of its economy are agriculture, phosphate, fishing, and tourism. Another upcoming industry is the garment industry. It is also culturally diverse and the government is fiercely dedicated to protecting its cultural heritage. April through September is considered tourist friendly. It is a popular African destination justified by the Marrakesh, Casablanca, Tangier, Fes, the Atlas Mountains etc. Essaouira is a beautiful beach. Camel treks to Merzouga evokes the classic images of the Sahara desert and for many it is beyond words. Its cuisine is also very diverse being a blend of cuisine from around the world. Their most famous dish is couscous, as the national dish pastilla, and harira are reserved for special events like Ramadan. Morocco Eyewitness Travel Guide 978-0756661977 $20 Traveler’s introduction followed by region-wise coverage. Excellent photos. Maps could be better. Laminated Morocco Map by Borsch 978-3866093560 $11 Scale 1:1,400,000. Inset maps of Morocco South, Tanger, Casablanca, Fes, Rabat, and Marrakech. The first stamps of Morocco were a set of seven stamps released between 1956 and 1957 that shows a portrait of Sultan Mohammed V. The set (Scott #1 to #7) catalogs for around $8 MNH and around $2 for used. The stamps issued till 1958 were intended for use only in the Southern French currency zone. The first stamps of the Spanish currency zone were a set of eight stamps released on August 23, 1956. That set (Scott #1 to #8) is more desirable and catalogs for around $25 MNH and around $14 used. The designs show Sultan Mohammed V, Villa Sanjurjo Harbor, Polytechnic School, and Institute of Culture in Tetuan. A stamp released on April 25, 1960 to mark the 900th anniversary of Marrakesh. The stamp (Scott #38) catalogs for around a dollar MNH and around half that for used. 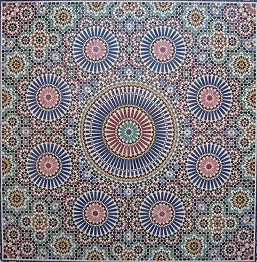 The design shows a view in Marrakesh. A set of six stamps released in 1965 showing shell fish. The set (Scott #123 to #128) catalogs for around $6 MNH and around half that for used. The designs show triton shell, varnish shell, great voluted shell, helmet crab, and mantis shrimp. A long set of twenty one stamps released between 1973 and 1976 showing King Hassan II and Coat of Arms. The set (Scott #275 to #294A) catalogs for around $22 MNH and around $7 for used. There are a number of stamps and sets portraying King Hassan II (Scott #75 to #84, #169 to #188, etc) and all of them catalog for a slight premium over regular issues during the same periods. A set of two stamps released on December 13, 1993 in the Water Birds theme. The set (Scott #770 to #771) catalogs for around $2 MNH and around a dollar for used. A booklet pane of ten self-adhesive stamps released in 2005 showing People. The set (Scott #1011a-j) catalogs for around $13 MNH and around half that for used. The designs show two women, Ait Mouhad, Saharaoui Derraa, two women, Citadin, Saharaoui Melhfa, Tata woman, Tata man, Meknassa, and Mokhazni du Roi. Modern milled coinage was introduced in Morocco in 1882 with the release of Silver Dirhams at the Paris Mint. The issues have high mintage into the millions but are still valued upwards of $20 in UNC. Prior to this, hammered coinage under Sidi Mohammed IV and other rulers dominated the scene. Common coins from hammered coinage period include copper coins denominated in falus, silver coins denominated in dirham, and gold coins denominated in benduqi. In the modern era, gold coins were first issued in 1952 with the release of a 50 Franc issue showing Date in inner circle of doubled tri-lobe star in Obverse and Value within doubled square within circle in Reverse. Since then, a number of low mintage gold coins have been issued and they are valued highly. Coins $2 and up Recent UNCs from the 1980s onward starts around $2. Silver Dirhams from the 1960s in VF, Bi-metal King Hassan UNCs from 1995, etc start around $10. Silver UNCs from the 1960s and 1970s start around $40. Scarce Pope Silver Proofs of 1986, Rare Silver Coins in high grade from the 19th century, etc go well into the 100s. Paper Money $3 and up Common UNCs start around $3. Large Notes from the 1940s in XF starts around $15. Rare Replacements from the 1970s onward, Consecutive UNC banknotes of 5-pieces or more, etc starts around $50. Bundles and Rare Specimens go into the 100s. Leather goods, woodwork, and handicrafts are the typical souvenirs of the place. Rocks and Fossils $10 and up Fossil coral specimens, fossil shark teeth, meteorite samples etc start around $10. Starfish fossils, Azurite Crystal Clusters etc go into the 100s. Art $10 and up 19th century local scenes prints and historical photos start around $10. Original Oil Paintings, Royalty Photos, etc start around $50. Original works by Robert Ritter, Daniel Sherrin, Robert Rauschenberg, etc start in the 100s. Jewelry $3 and up Loose Agate beads start around $3. Natural Agate Necklaces start around $20. Larger Vanadinite, Cobalto Calcite, Azurite, etc Gemstones go into the 100s. Antiques $10 and up Neolithic tool knifes start around $10. 19th century and prior maps start around $25. Berber Tribal Pile Rugs, Batania Kilims, Tribal coral-amber necklaces etc start around $100.